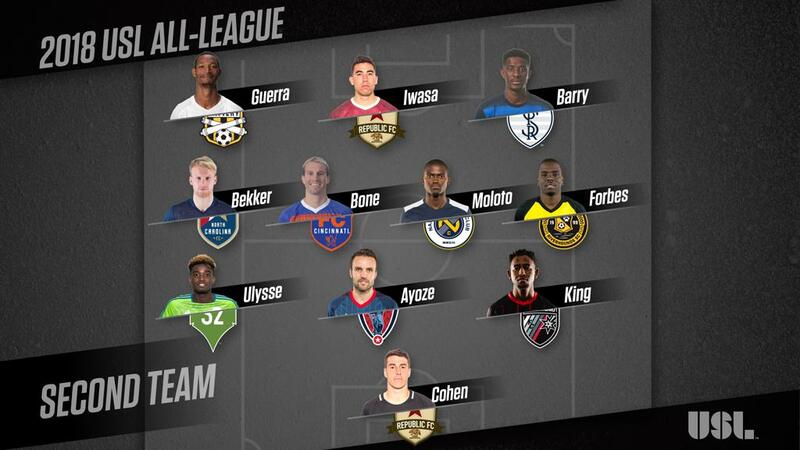 TAMPA, Fla. – Standout performers from the 2018 USL regular season were honored on Monday as the United Soccer League announced the 2018 USL All-League Teams, with a pair of players from FC Cincinnati, Louisville City FC and Orange County SC each earning First Team honors and 14 clubs from across the league being represented among the 22 selections overall. 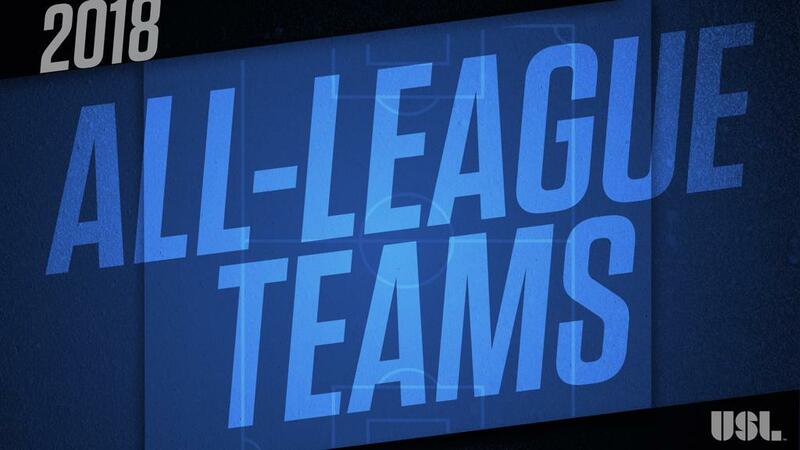 The 2018 USL All-League Team was voted on by club management and a league-wide media panel that included representation from every USL market. 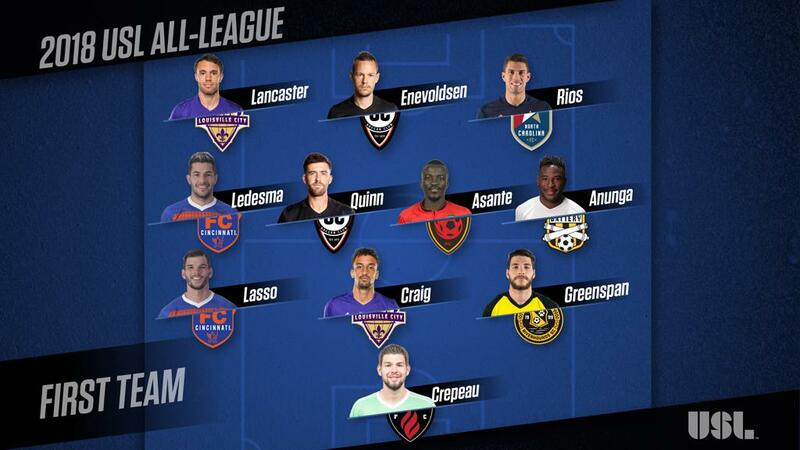 Two players earned selection to the All-League First Team for a second consecutive season, with defenders Forrest Lasso of FC Cincinnati and Paco Craig of Louisville City FC once again recording standout seasons for their respective clubs. Two other players, Pittsburgh Riverhounds SC midfielder Kenardo Forbes and Sacramento Republic FC forward Cameron Iwasa, also earned their second career selections with Second Team honors. Lasso was joined on the All-League First Team by FCC teammate Emmanuel Ledesma, who set a USL regular-season record with 16 assists as the duo helped lead the side to the 2018 USL Regular Season Championship. FCC’s Corben Bone was also recognized on the All-League Second Team after a standout season for the club. Louisville forward Cameron Lancaster, who claimed the USL Golden Boot with a regular-season record 25 goals, was also selected alongside Craig from the defending USL Cup champion, while Orange County SC was represented on the First Team by midfielder Aodhan Quinn and forward Thomas Enevoldsen, whose contributions led OCSC to a first-place finish in the Western Conference for a second time in the club’s history. The finalists for the 2018 USL Awards will be announced on Tuesday, preceding the 2018 USL Cup, which will air live on ESPN2 and the WatchESPN app in the United States and be broadcast globally in more than 50 countries on ESPN International on Thursday, November 8 at 8 p.m. ET as Eastern Conference champion and defending USL Cup champion Louisville City FC faces Western Conference champion Phoenix Rising FC and legendary forward Didier Drogba at Lynn Stadium in Louisville, Ky.
GK – Maxime Crepeau, Ottawa Fury FC: Crepeau set a USL regular-season record with 15 shutouts as he recorded 82 saves across 31 appearances for a 72.6 save percentage. D – Paco Craig, Louisville City FC: Craig finished second among defenders with 239 duels won at a success rate of 66.8 percent and ranked in the top five among defenders with 133 aerials and 171 possession recoveries. D – Joe Greenspan, Pittsburgh Riverhounds SC: Greenspan led a Hounds defense that tied the USL regular-season record with 17 shutouts, posting 176 clearances while winning 67.1 percent of duels and 76.2 percent of aerial duels over the season. D – Forrest Lasso, FC Cincinnati: Lasso led the league with 223 clearances while finishing second in the league with 32 blocked shots and 172 aerials at an 82.7 percent success rate. M – Tah Anunga, Charleston Battery: Anunga was dynamic in the center of the Battery’s midfield, leading outfield players with 308 possession recoveries, finishing second with 72 tackles won, while posting an 83.51 passing accuracy rate on 52.58 passes per 90 minutes. M – Solomon Asante, Phoenix Rising FC: Asante recorded 13 goals and eight assists to lead Rising FC to a top-three finish in the Western Conference, while also finishing third in the league in chances created (98) and fourth in chances created from open play (56). M – Emmanuel Ledesma, FC Cincinnati: Ledesma set a single-season record with 16 assists in the regular season, and with 16 goals also became the first player in the USL’s history to record at least 15 goals and 15 assists in the same campaign. M – Aodhan Quinn, Orange County SC: Quinn played every minute of the regular season to lead OCSC to a first-place finish as he recorded 11 goals and 14 assists while leading the league with 103 chances created and finished second among outfield players with 289 possession recoveries. F – Thomas Enevoldsen, Orange County SC: Enevoldsen finished tied for second in the league with 20 goals at a chance conversion rate of 28.99 percent, while also recording nine assists and 63 chances created as he played every minute of the regular season. F – Cameron Lancaster, Louisville City FC: Lancaster set a USL single-season record with 25 goals to claim the USL Golden Boot and scored at a rate of a goal every 80.16 minutes while registering seven of his tallies from outside the penalty area. F – Daniel Rios, North Carolina FC: Rios recorded 20 goals to finish tied for second in the league and did so at a chance conversion rate of 32.79 percent, the highest of any player to record at least 15 goals in the regular season as he averaged a goal every 111.05 minutes. GK – Josh Cohen, Sacramento Republic FC: Cohen recorded 117 saves, second-most in the league, at a league-leading save percentage of 78.52 among goalkeepers with at least 40 saves. Playing every minute of the season, Cohen registered 12 shutouts and a 0.94 goals-against average. D – Ayoze, Indy Eleven: Ayoze helped lead the Eleven to a postseason berth in its first season in the league with a club-best eight assists and 57 chances created, while also chipping in four goals and recording a 36.36 percent accuracy rate on crosses. D – Darnell King, San Antonio FC: King showed off a well-rounded game in his first season with SAFC, finishing the season with five assists and 24 chances created while recording 170 possession recoveries, 69 interceptions and 127 clearances, all of which led San Antonio defensively. D – Denso Ulysse, Seattle Sounders FC 2: A selection to the 2018 USL 20 Under 20, Ulysse put together a strong second season with S2 that saw him finish tied for third in the league with 78 interceptions and also record 20 chances created. M – Kyle Bekker, North Carolina FC: Bekker finished tied for third in the league with 13 assists and recorded 63 chances created for NCFC while also registering an 81.01 percent accuracy rate on 48.31 passes per 90 minutes. M – Corben Bone, FC Cincinnati: Bone recorded 11 goals and four assists to help lead Cincinnati to the 2018 USL Regular Season Championship, while also recording an 83.78 passing accuracy rate and 38 chances created from open play in the regular season. M – Kenardo Forbes, Pittsburgh Riverhounds SC: Forbes led the Hounds with eight assists and notched four goals but also showed off his two-way abilities with 285 possession recoveries – third among outfield players – and 50 interceptions. M – Lebo Moloto, Nashville SC: Moloto recorded seven goals and five assists to help Nashville claim a postseason berth in its first professional season and registered 51 chances created and an 80.79 passing accuracy rate on 44.1 passes per 90 minutes. F – Hadji Barry, Swope Park Rangers: Barry set a new single-season record for the Rangers with 17 regular-season goals and set a league record with a streak of eight consecutive games with a goal to help lead the club back to the postseason. F – Ataulla Guerra, Charleston Battery: Guerra led the Battery with 15 goals and also notched five assists alongside 32 chances created from open play to help lead Charleston back to the USL Cup Playoffs for an eighth consecutive season. F – Cameron Iwasa, Sacramento Republic FC: Iwasa recorded 17 goals and six assists for Republic FC, setting a single-season scoring record for the club while also becoming its all-time leading scorer as it took a second-place finish in the Western Conference.